connect with like minded businesses that share a similar passion for serving caregivers. We do it by hosting storytelling that comes from the heart and connects people together in a powerful, meaningful way. One Legacy offers a one-of-kind service which personally reaches out to families and documents priceless stories of their loved ones so that their memories are preserved forever and leave a legacy to future generations. 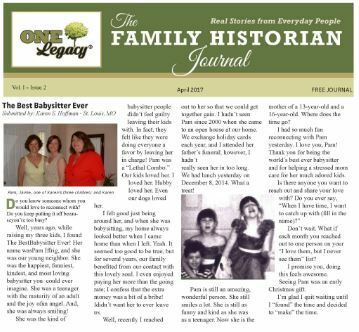 These inspiring stories are shared with our online community and in the new Family Historian Journal, distributed to hundreds of local business lobbies each month. The result is magical. 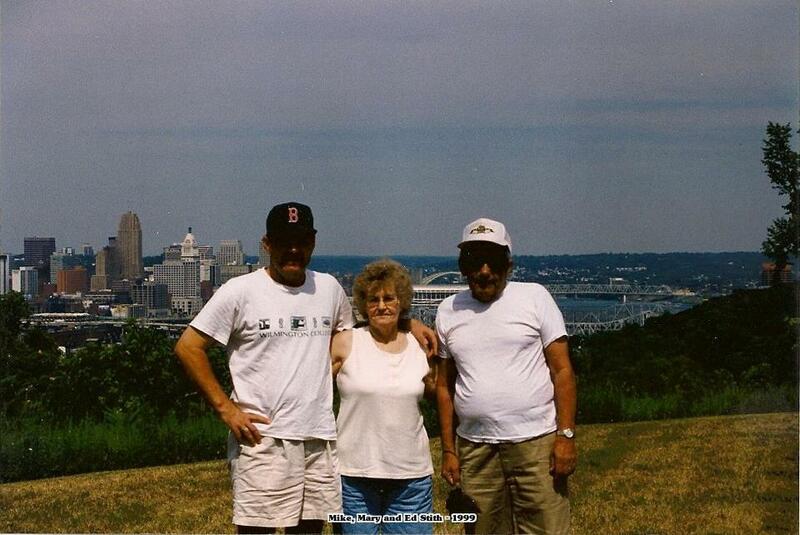 I came up with the idea a few years ago while my 77-year-old mother was fighting cancer toward the end of her life. When my mother was ill, I spent many hours, sometimes days, with her in hospital, care centers and eventually in hospice care. While visiting her, I often saw people alone in their rooms with very few visitors. I’d say hello when I had a chance, but not nearly enough. The story of my mother’s life and passing was a key inspiration in my life, and fueled my passion to create the One Legacy community. It all began by while passing time, asking mom a few simple questions about her own childhood. I learned that her favorite pet was a little fluffy Shiatsu named “Little Bit,” and her favorite song was Judy Garland’s “Somewhere Over The Rainbow.” They were simple but meaningful questions and answers. Other residents wanted to answer the same questions. From there, my life purpose unfolded. never knew before. I was aware of her change in mood as she talked and responded. It was then I learned the true value of telling our stories. I was inspired to capture and learn more about my own heritage. The intimate experience with mom inspired me to develop a new program called Legacy Sharing. It’s very simple in concept, but extremely rewarding for individuals, families, and communities. It provides the special people in our lives an opportunity to share their stories and legacies with others. In particular, The Legacy Sharing Program assists care centers or any group in facilitating, gathering and publishing real stories written by residents and their families. Storytelling and sharing exercises are proven to enhance healing and recovery. 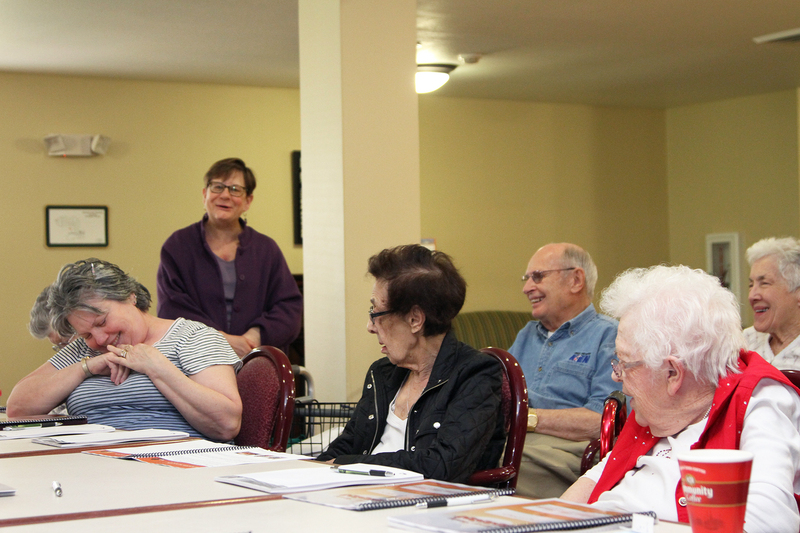 If you are a host of group activities for seniors, veterans or even youth organizations, ask us about how they can make it easier for you to enrich quality of life for your group. We have a variety of tools for you to facilitate these individual or group reminiscence activities. We’re happy to produce newsletters or books with your stories. We’ve learned that story tellers love to be heard and One Legacy is honored to share many of these amazing stories with the community. All are available here on our website and many are posted on our Facebook page. 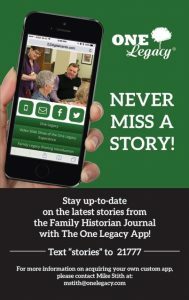 We’re also proud to announce many of these Family Historian Journal, a free monthly publication delivered to lobbies in hundreds of businesses (hospitals, retirement homes, restaurants and many more) currently in the St Louis metro area. Here’s something we discovered that’s really cool. For those with a SmartPhone you can get a great look at the latest One Legacy stories and videos. Click on this image to view our card. From your phone you can text the word STORIES to 21777. We’ve only used this EZ Digital Card for a month but have already discovered this is one of the best new digital products on the market today. You can show everything about your business, organization, or cause, all with just a click or text from your phone or email. In summary, so many people have inspirational stories to share and, now more than ever, the world needs to hear them. Especially for those people sitting in isolation looking for a meaningful story to read. One Legacy is so honored to collect and offer these to our readers. Each of us has a Legacy to share! Share yours today! With this introduction, I’m inviting you or your business to join me to help expand our program and offer our services to even more families and communities. At One Legacy, we often use the tag line “Each day has purpose. Every life has meaning”. We strive to have a positive impact and provide everyone an opportunity to share a story that will inspire others. Thank you!